At this Chinese Buddhist Temple you'll find two jade Buddha statues imported from Burma, along with many other cultural relics. 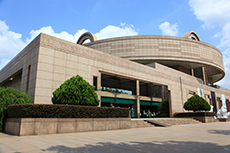 It is a peaceful attraction that contrasts the hustle and bustle of Shanghai. In Shanghai, Jin Mao Tower is an 88-story skyscraper that is known to be one of the world's tallest buildings. From the top of the building you'll have a panoramic view of the city and the Huangpu River. If you're looking for a moment of reprieve, you must visit The Humble Administrator's Garden. The tranquil atmosphere and the impeccable design make this garden a special trip that everyone will enjoy. The Bund is the waterfront area alongside the Huangpu River and it has been considered the city's symbol since the 1920s. 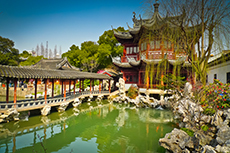 One of the most lavish and finest Chinese gardens in Shanghai. Established in 1559, the gardens feature five acres of spellbinding cliffs, winding caves and gorges, ponds, and glorious pavilions and pagodas. 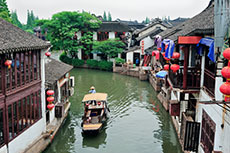 Glide aboard your boat through the interwoven canals of historic Zhujiajiao and take in the distinctive style of its bridges, including the dragon-adorned Fangsheng Bridge, built in 1571. 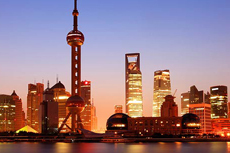 The Bund: Shanghai's most memorable mile is the place to see and be seen for visitors and locals alike. Walk along Zhongshan East 1st Road for close-up views of buildings that include the Art Deco Peace Hotel, towering Bank of China and the Customs House, topped by a clock face and bell modeled after London's Big Ben. Or check out the elevated waterside promenade (reached via underground tunnel) for the best views of the rocket-shaped Oriental Pearl and Jin Mao towers, the Shanghai World Financial Center and the Shanghai Tower, currently China's tallest building. 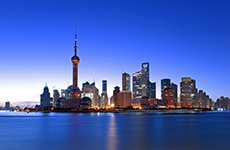 Although it's a magnet any time of day, the best time to go is at night when the Pudong skyline is a light spectacle. Old City (Nanshi): This enclave, located in the southeastern part of the city, provides a tantalizing glimpse of 16th-century Shanghai. Behind the inevitable souvenir stands sit beautiful old buildings, temples and pagodas. The bustling bazaar is a fun place to watch locals queue up for dim sum or to wander through the narrow side streets. The area is bordered by the Renmin and Zhonghua roads that follow the line of the original walls built to keep Japanese pirates at bay.